Plate 3 from the fifth set of Thomas and William Daniell's 'Oriental Scenery' called 'Antiquities of India.' 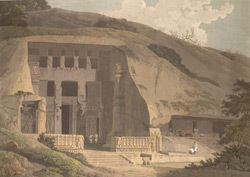 The caitya hall at Kanheri, near Bombay, is the main cave of a group of Buddhist rock-cut temples associated with a large Buddhist community which flourished here in the 1 - 2nd Centuries. The exterior consists in a rock-cut wall with octagonal columns on each side and large reliefs of standing Buddha (added later). The hall has columns with pot bases and bell capitals surmounted by animal riders. At the end of the central aisle there is a hemispherical stupa as this was the main congregational place of worship.